What do you mean you have never heard of cost per click advertising? Before I go in answering the question, let me provide a little background information on what exactly cost per click advertising is. A website that uses CPCs would bill by the number of times a visitor clicks on a banner instead of by the number of impressions. Cost per click is often used when advertisers have a set daily budget. When the advertiser’s budget is hit, the ad is removed from the rotation for the remainder of the period. An example of this is if a website that has a CPC (Cost Per Click) rate of $0.10 and provides 1,000 click-throughs would bill $100. Single CPC for top twenty keywords ranged from an astonishing $311.53 to $455.05. This figure is far above the average, which lies between thirty cents and one dollar. Studies show that big money law firms will often pay more for customer acquisition because their return is usually much greater. I am currently participating in a collegiate DECA competition and my event is called Advertising Campaign. It just so happens that some of the different advertisements that we are running are on a cost per click system. It’s is our goal to find the most effective way possible to advertise for a certain company, our’s being Snoqualmie Ice Cream. We chose to go with cost per click advertising because it allowed us to set very specific limits on how many clicks we wanted and how much we wanted to spend. 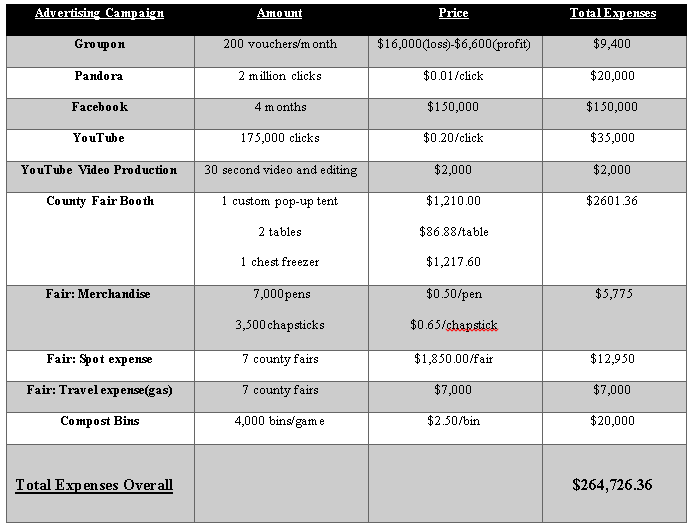 Here is a picture of our budget and it includes the cost per click of Pandora and YouTube. This type of advertising is quickly becoming the more popular option because you pay what you want and you can set limits on how many clicks you want the ad to have. With so much of marketing and advertising moving towards the Internet and different online advertising, this is becoming the new standard way of advertising. It is very friendly to the budget minded company and also enables the company to get their name out to many many people. For more information about online advertising visit this link. ← Can I set up my own Amazon Server… Yes I Can!! !